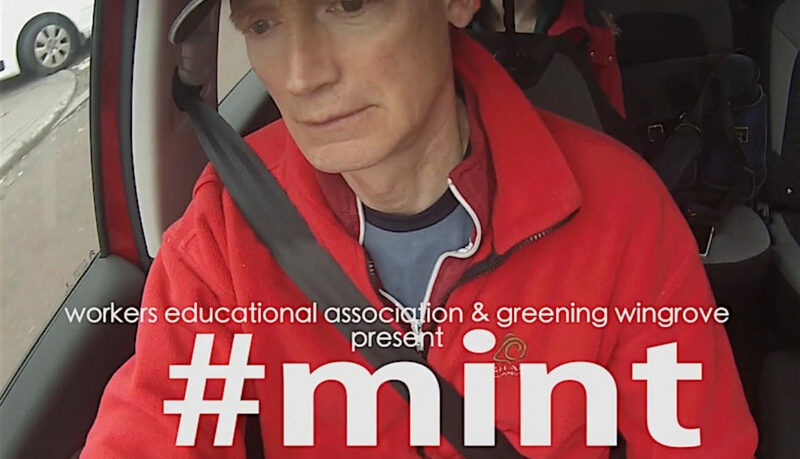 #mint … is the title of a brand new video about the art of gardening in small spaces, a trend that has become fashionable in the Arthur’s Hill, Wingrove and Fenham areas of the city over the last few years. The short video, set to a rap music soundtrack (Gardening is Gangsta), highlights the growing Vertical Veg movement that has sprung up in the West End, which allows residents to create their own gardens by their front doors or in their back yards. It focuses on Vertical Veg pioneer Mark Ridsdill Smith, and features clips of street sessions and interviews with local people who have got involved since the scheme began four years ago. The #mint of the title refers to free mint plants given away to residents, to encourage residents to grow their own. Mark has been holding regular Vertical Veg street sessions at different locations in the area since 2013 and sees them as an important means of helping people in communities connect with one another and as a valuable tool to allow others to see how easy growing in small spaces can be. “TV gardening programmes are mainly aimed at people who have large gardens“, he says, “but at least 50% of people don’t“. The Vertical Veg street sessions are targeted at those who don’t, and as one Croydon Road resident, Laraine Hannah, put it, “people just walk past and they join in“. Mark says he has been impressed at the diversity of people who have got involved. The gardens people create have not only helped brighten up the streets, he adds, but being visible, they are a good conversation starter, helping neighbours to get to know one another. They are also a great way to grow tasty fresh food, right on your doorstep. For more information about up and coming Vertical Veg sessions in the area, check out the Greening Wingrove events page. Check out the Vertical Veg Facebook page, for more information about how to grow your own in small spaces and take part in a movement that has begun to take off internationally. The video was produced by local film and documentary maker Andy Jones. You can see more of his work on the RADiO FiLM Vimeo page.